In the final stretch of the Miss World 2016 contest, the trajectory of the race has been upended by a series of twists and unexpected occurrences. With Miss People’s Republic of China Jing Kong winning the all-important Top Model award, the perceived front-runners are now on a shaky ground. FROM UNIVERSE TO WORLD. Is Yaritza Reyes the next Miss World? Despite the fact that last year’s winner, Mireia Lalaguna of Spain, also won the Top Model Award – and is not the only precedent that equates the award with winning the blue crown – this year’s result should be taken with a grain of salt. That is why Miss People’s Republic of China Jing Kong has only landed in the 20th spot in the final Hot Picks. Meanwhile Miss Indonesia Natasha Mannuela rounded-off our list’s top ten and her rank is way higher because she also happens to be one of the Top 5 finalists of the equally important Beauty with a Purpose Award. Interestingly, the 3rd placer of the Top Model Award is on the second place in this Hot Picks. Miss Dominican Republic Yaritza Reyes is considered as the strongest candidate of color this year. Yes, she is the same Yaritza Reyes who had an unfortunate catwalk accident in Moscow three years ago at Miss Universe. And yes, she is the same elegant, beautiful and confident Yaritza Reyes. Is it time for Africa? So who else shined at the Top Model? Miss France Morgane Edvige is one of Top 5 but her poor showing in other contests and awards is not good enough to get past the Top 20 of this list and thus she settled for 23rd. Miss Kenya Evelyn Thungu is also in the Top 5 of Top Model and Missosology’s beauty experts believe she is Africa’s strongest delegate. Not only she is a Top 5 at the Top Model she is also one of the five finalists at the Beauty with a Purpose Award. She therefore earned the lucky 13th place in this final Hot Picks. Speaking of the African continent, South Africa still carries a huge sash weight. The country’s candidate, Ntandoyenkosi Kunene, gave a spectacular performance and there is some sort of expectations that she can pull off a surprise. She is the second highest African candidate in this list, placing a good 15th place. Meanwhile, Miss Tanzania Diana Luqumay is also a delegate to watch and another candidate that is positioned to surprise us all. She is currently ranked 22nd. Will the crown return in Asia and Oceania? 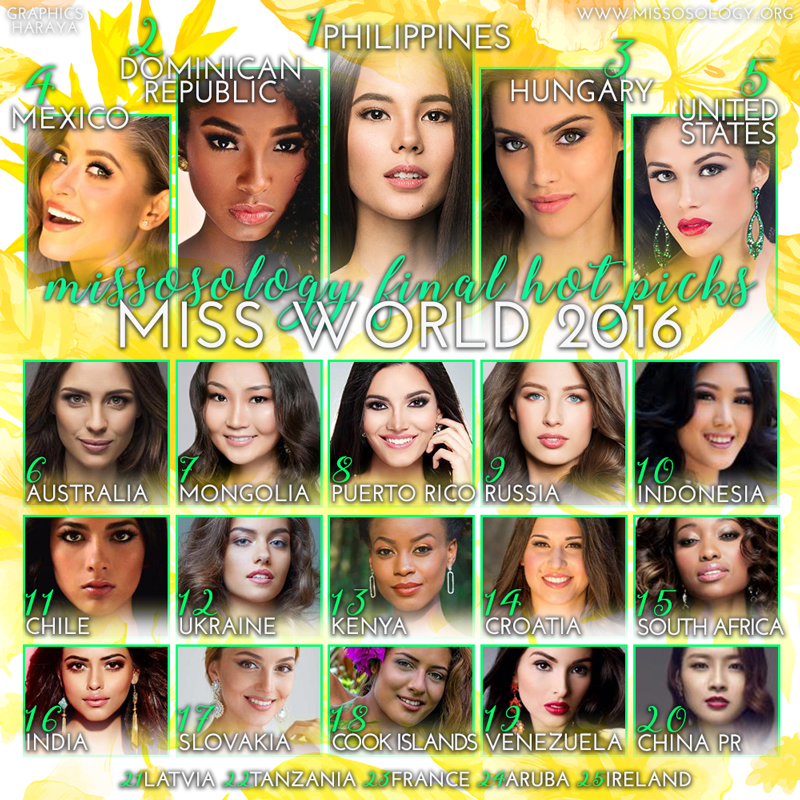 The Asian continent is poised to be the strongest continent in the pageant. Of course, the highest placed candidate in our prediction, Miss Philippines Catriona Gray, is Asian and while her victory is far from being 100% sure, there are signs all over the heavens. First and foremost, is that she won the Multimedia contest which automatically gives her a Top 20 place. Then, she is one of the Top 5 in the Beauty with a Purpose contest and landed 2nd at the Talent Competition. This elegant lady is simply unstoppable! Another Asian that has been shining throughout the competition is Miss Mongolia Bayartsetseg Altangerel. Basically, she is one of the most visible candidate by winning the Talent contest and her legion of online fans are giving her a boost. 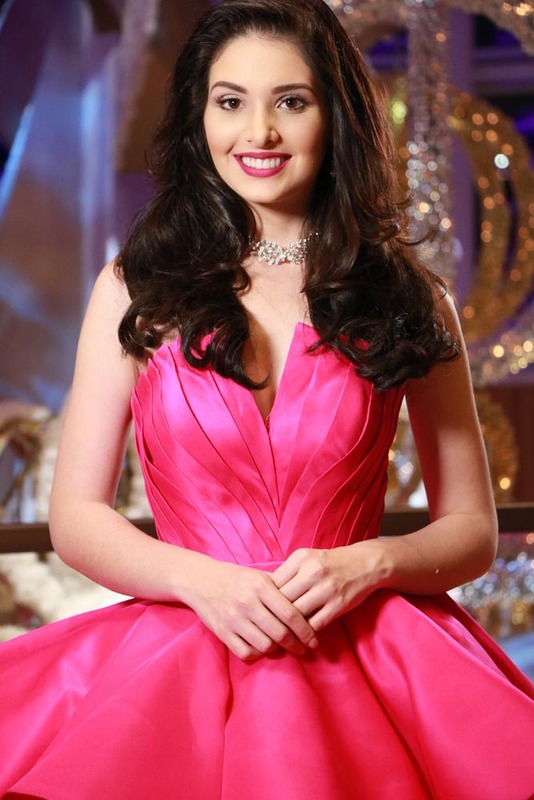 The Hollywood actress is bringing to Miss World her experience in international pageants and she impressed the general public by her sunny disposition and her undeniable confidence. Her wonderful performance is good for a 7th place! 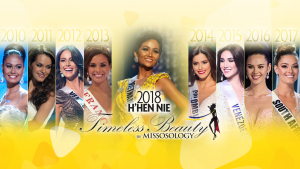 Miss Indonesia and Miss People’s Republic of China, as mentioned earlier, are two Asian candidates that gained a lot of momentum in the final stretch of the competition. Another Asian worth mentioning is Miss India Priyadarshini Chatterjee (13th Place) who exudes intelligence and elegance. She is one of the finalists of the Talent Contest plus she is included in the Top 5 of the Beauty with a Purpose. One can say that she has truly exceeded the expectations of the many. India is well represented at Miss World 2016 and Priyadarshini can simply wow us at all the finals night! Australia will carry the banner of the Oceania region. Madeline Cowe (6th place), the drop dead gorgeous Aussie is simply stunning to be ignored. Rest assured she will shine in the finals night and what most analysts like about her is her laid back, easy going demeanor. She is having fun despite the fact that this is an intense competition. 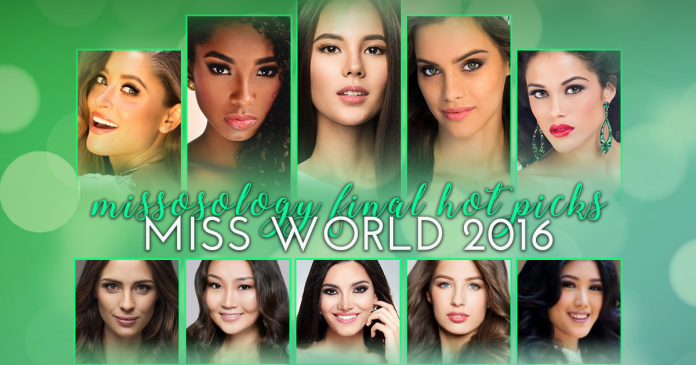 Another candidate from the region that made it to this Hot Picks is the first candidate to be included the semis of Miss World 2016. Miss Cook Islands Natalia Short (18th place) won the Sports Contest and thus will become the first beauty queen from her land to land in the semis of any of the Big5 Pageant. Is the Americas ready for a new Miss World? Not to be outdone, the Latin American region is well represented as well. With Miss Dominican Republic Yaritza Reyes leading the way, Miss Mexico Ana Girault (4th Place) is in the close second among the Latinas. Ana is very vocal and direct and she could be the perfect advocate for Miss World causes. Sure, the pageant gave Mexico several heartaches but will they finally give the blue crown to the country? Will Venezuela finally make it back to the semifinals? Also in a serious contention for the crown is Miss Puerto Rico Stephanie Del Valle (8th place). Her elegance, her glamorous beauty and her magnetic personality will make her a perfect Miss World. Miss Chile Antonia Figueroa (11th place), meanwhile, did well in her talent performance allowing her to occupy a higher rank in our previous Hot Picks. Miss Venezuela Diana Croce (19th pace) has been closely followed and while there is a clear attempt in her part to remind everybody the glory days of Venezuela at Miss World, she seems to have fell short of her goal. 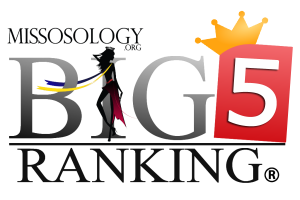 Miss USA Audra Mari (5th place) is expected by Missosology’s panel of beauty experts to do well. This is not just about being the host candidate or being a local girl. She carried herself well for the past weeks and there is no other choice but to take her seriously as a candidate. 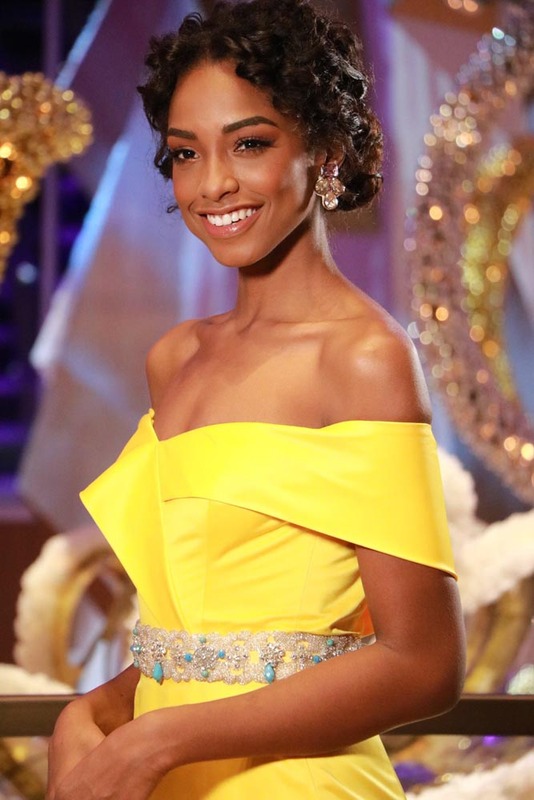 She is one of the non-Latina candidates – along with Miss Aruba Lynette Do Nascimento (24th place) – who hails from the American region that made it to this final Hot Picks. Will it be a back-to-back for Europe? Among the Europeans, Miss Hungary Tímea Gelencsér (3rd place) is the clear front-runner. She did well at the sports competition and gave her opponents a scare at the Talent contest. Having come this far will give her that extra edge as the pageant nears its conclusion. While Timea has been underrated before she set afoot in the US, Miss Russia Yana Dobrovolskaya (9th place) meanwhile has been the favorite months before the competition. But unlike Timea, Yana seems to have lost steam but still a favorite of many pageant observers. Oleksandra Kucherenko of Ukraine (12th place) is also a candidate to watch although she is not that visible in most of the ccontests. Miss Croatia Angélica Zacchigna (14th place) should never be underestimated as she placed in both Talent and Sports competition. 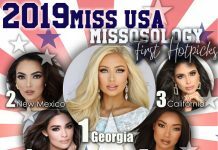 Other European beauties to watch which are all in the bubbling up category are Miss Latvia Linda Kinca (21st Place), Miss France Linda Kinca (23rd Place) and Miss Ireland Niamh Kennedy (25th Place). Saving perhaps the best for last, Miss Slovakia Kristína Činčurová (17th place) has been the talk of the town lately. She is perhaps the most beautiful, most appealing of them all. If Miss World has been all about beauty and nothing else, hands down Kristina should be the winner. Her inability to shine in so many contest speaks in volume about the fact that it takes more than just to be beautiful to win in this contest. This is not to belittle Kristina’s personality which everyone agrees is great. This is just to say that she was edged out by many other girls in other categories such as sports, talent, charity projects and modelling skills. Having said all that, if Kristina will win tonight, it shouldn’t come as a surprise.